Glasgow weathered the storm better than Scarlets at Scotstoun to go back to the top of the Pro12 table. Alex Dunbar's early try gave the home side a deserved lead despite the driving wind and rain in their faces. Liam Williams' try and Rhys Priestland's conversion somehow handed Scarlets a half-time lead. But, with second-half conditions in their favour, tries from Peter Murchie and DTH van der Merwe, plus Finn Russell's kicking, ensured a home win. 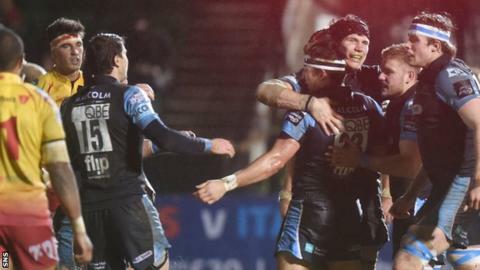 Glasgow fell short of a bonus point, but their 15th consecutive Pro12 home win ensured they bounced back from the disappointment of last week's derby defeat by Edinburgh. Scarlets kicked off playing with the howling wind at their backs, but it was Warriors who were presented with the first scoring chance after a spell of home pressure. However, the problems that kicking was going to present on a such a night were evident when Russell missed the far post by yards from a normally kickable penalty distance. Priestland, who it was announced in midweek will join Bath after the 2015 World Cup, failed to threaten the posts with two attempts, the second monster attempt from just inside the Glasgow half falling woefully short even with the gale at his back. Warriors' claims for a try were denied after consultation with the TMO after Josh Strauss crashed towards the line among a sea of bodies. Glasgow continued to inch forward with wave after wave of attack against the wind and Sean Lamont offloaded for Dunbar to score in the corner after 28 minutes. Russell was again unable to cope with the wind as his conversion attempt dropped short and wide. Glasgow threatened another try after a superb jinking run from Niko Matawalu, who is also heading to Bath in the summer. However, when a pass from the Fijian scrum-half was intercepted, Aled Davies offloaded for Williams to exploit a gap and the Wales full-back superbly ran in a try against the balance of play. Priestland added the conversion to give Scarlets an unlikely lead on the stroke of half time. Glasgow took advantage of the strong wind to put the Welsh side under pressure immediately after the break and, when the ball was passed along the line, Murchie just did enough to touch the ball down in the corner. Russell did well to curl in the conversion from near the touchline and Scarlets' hopes were delivered a further blow when star man Williams went off with a shoulder injury. Scarlets steadied themselves and were soon battering against a thin but firm dark blue line. Glasgow survived without the scoreboard turning over and Russell fired them further ahead with a long and straight penalty. Scarlets were going backwards despite possession in their own half and, when they eventually lost the ball, Warriors piled forward and a little reverse pass by Matawalu set van der Merwe charging over the try line, with Russell accepting the conversion. Glasgow Warriors head coach Gregor Townsend: "I think that's one of our best performances of the season. "Certainly the first half is one of the best we've played because to play in these conditions is really tough. "I was so proud of the way the team came together and we did hammer on that try line on a few occasions to get a try and I was really disappointed to go in at half-time losing. "But they showed great resolve in the second half - and tactical awareness as well - and we're really pleased with the win. "It was a great response to last week. All the top four lost last week, so we did miss an opportunity to get a march over Ospreys. "They are playing at home against Dragons, but it is good to put pressure on them." Scarlets captain Scott Williams: "We're a bit disappointed. Glasgow played the conditions better than us and, in fairness, they deserved to win. "It's about going back into Europe now and putting in two big performances [against Leicester and Toulon]." Glasgow Warriors: Murchie, Seymour, Dunbar, Horne, S. Lamont, Russell, Matawalu, Yanuyanutawa, MacArthur, Cusack, Swinson, Gray, Nakarawa, Wilson, Strauss. Replacements: Downey for Horne (75), van der Merwe for S. Lamont (47), A. Price for Matawalu (72), Grant for Yanuyanutawa (43), Brown for MacArthur (60), Murray for Cusack (43), Eddie for Gray (60), Bordill for Wilson (67). Scarlets: L. Williams, Parkes, King, S. Williams, Tagicakibau, Priestland, A. Davies, R. Evans, Elias, Adriaanse, Ball, Snyman, A. Shingler, Barclay, McCusker. Replacements: J. Williams for L. Williams (47), S. Shingler for King (78), G. Davies for A. Davies (57), T. Myhill for Elias (55), P. Edwards for Adriaanse (55), Earle for Snyman (28), W. Jones for A. Shingler (73), Rawlins for McCusker (57).